November 3, 2016 – The sweet potato, a root vegetable, is one of the most nutritious foods in the vegetable group. Often confused with yams and labeled as such in grocery stores, sweet potatoes are more moist and sweet than yams. 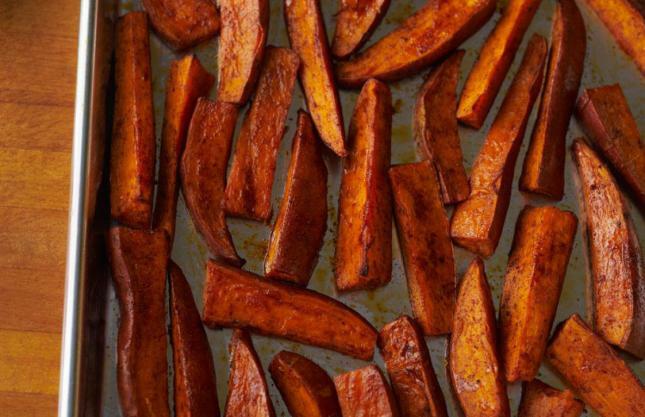 Choose sweet potatoes without cracks, soft spots, or bruises. Wash well, using a vegetable scrubber. Leave the skin on for more nutrition or for easier peeling after baking. Pierce skin with a fork before baking or microwaving. Children and adults participating in the Let’s Eat Healthy! Program are learning about eating colorful vegetables like sweet potatoes. For more nutrition or program information, please call (530) 889-7350 or visit our website at http://ucanr.edu/sites/letseathealthy. 2. Scrub and rinse sweet potatoes. Pat dry with a paper towel. 3. 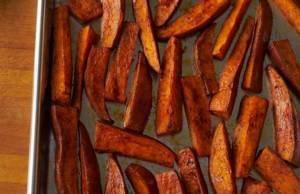 Leaving skin on, cut sweet potatoes into strips, about ½-inch wide. 6. Coat baking sheet* with non-stick cooking spray. Place sweet potatoes in a single layer on the sheet. 7. Bake for 15 minutes. Turn fries over and bake another 10-15 minutes, or until tender. * For easier cleanup, first line the baking sheet with aluminum foil, then coat with non-stick spray.